Department of Orthopaedics, M S Ramaiah Medical College, Bangalore, India. Background: Pott’s spine corresponds to fifty percent cases of skeletal tuberculosis. The subject of using metallic implants in the setting of infection remains controversial and with the limited literature in the middle path regimen for painful stable lesion makes decision for surgical management difficult. We conducted a prospective case study over a 2-year period in order to analyze the clinical features, management and outcome of spinal tuberculosis. Materials & Methods: 21 Patients with failed conservative or unstable pott’s spine were treated with single stage debridement and posterior stabilization and fusion with pedicle screw and bone graft. Post-surgery patients were excluded. Back pain and quality of life were evaluated with a Visual Analog Scale (VAS) and the Oswestry Disability index (ODI). At the follow-up radiological studies were performed at 1, 6 and 9 months interval and later yearly interval, to check for fusion. Result: The back pain was reduced within 7 days after surgery and completely relieved within a month, for 92% of patients. Neurologic deficits, present in 5 cases, all improved. Radiological signs of fusion occurred after 3 months in 60% of the patients, and after 6 months in 80% of the patients. The mean VAS improved from 8.2 preoperatively to 2.4. The mean preoperative ODI improved from 84% to 36.8%. No recurrence of infection or implant failure was noted. Conclusion: Tuberculosis should be considered as one of the causative agents in patients diagnosed with spondylodiscitis. Delay in surgical management of which has lead to development of unstable spine and morbidity. Hence careful selection of patients with spinal tuberculosis for surgical management is of outmost importance and no hesitation should be there in debridement and instrumentation. It was found to provide effective relief of symptoms and better quality of life with early mobilisation. 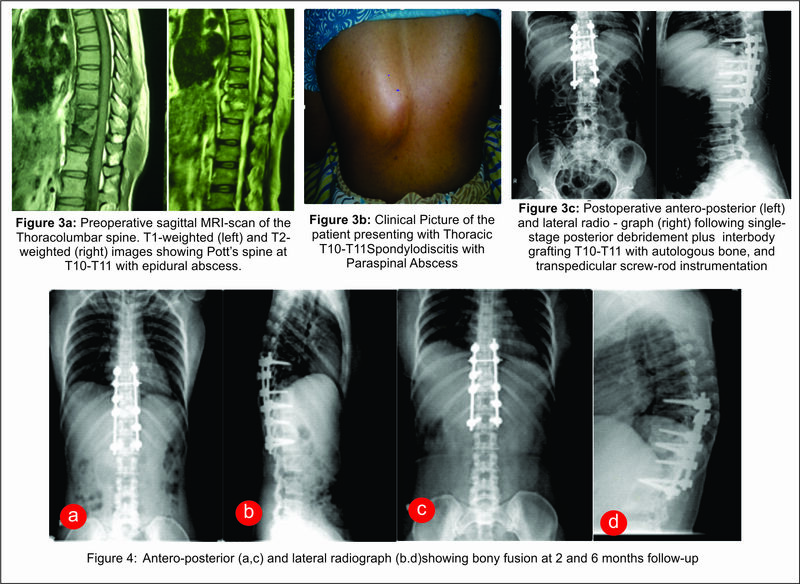 Keywords: Visual analog scale, Oswestry disability index, Pott’s spine, Spinal tuberculosis, Instrumentation..
Spondylodiscitis is a rare entity, often occurring secondary to spinal surgery. Among them in Indian set up, spinal tuberculosis is a relatively common pathology. Pott’s spine corresponds to fifty percent cases of skeletal tuberculosis. Usual presentation of the patient includes fever, chronic back pain, local tenderness, deformity and neurological deficits, etc. The course is usually chronic, due to the non-specific symptoms there is delay in diagnosis leading to potentially high morbidity and mortality. However with the advent of Magnetic Resonance Imaging (MRI) for early diagnostics and early use of Antitubercular therapy, the morbidity and mortality rate has declined in the past decade. Increase in the incidence has recently been noted due to increasing life expectancy, predisposing underlying conditions, such as diabetes mellitus, immunocompromised, spinal abnormality, HIV and steroids, etc[2,8,9]. The proposed theory is that of haematogenous spread of the bacteria. In adults, the avascular nature of the disc counters inoculation, but it facilitates infection once inoculation has occurred [8,10,11]. Conservative management is effective in most cases; however surgical intervention is indicated in case of failure, progressive neurologic impairment, spinal instability, severe pain and/or local spinal deformity[7,8,10,11]. In today’s scenario spinal instrumentation can be extended to this category of patients in order to provide stability for early mobility, as how it is routinely used in trauma. All patients included in our study underwent adequate drainage/debridement of the infected level followed by stable pedicle screw fixation and interbody bone grafting harvested from the iliac crest or laminectomy. Aim of this study is to evaluate the efficacy of the procedure (posterolateral fusion) by comparing clinical and radiological short term results which will help assessing long term outcome. This is a prospective study on a sample of 21 patients diagnosed with thoracic and lumbar spinal tuberculosis, between the age group of 18 to 70 years. They were diagnosed based on clinical history, physiological and neurological examination, blood parameters and MRI. The included patients required surgical stabilization based on the instability, pain and neurological status. The study was conducted between January 2014 and December 2016. Patients with prior history of spine surgery, history of any trauma and neurological deficits more than 6 months were excluded from the study. Patients with malignancy, long-term steroid use, and immunosuppressive therapy and HIV infection were considered as immunocompromised. In the current study patients presenting with predisposing conditions: Diabetes mellitus (11 patients), Hypertension (3 patients), Steroid intake (2 patients), HIV patients (2 patients) Chronic Kidney Disease (1 patients), Table 1. The average follow-up period was 15 months, with a minimum of 12 months for all the patients. Demographic, clinical, laboratory, and radiological data were collected prospectively for each case. Also medical and surgical data were collected from the day of presentation to last day of follow-up (or death) which included severity of pain, level of vertebral involvement, use of Antitubercular therapy, the duration of therapy, worsening of medical conditions and systemic complications. MRI findings suggestive of pott’s spine included increased signal of the intervertebral disc on T2 images, vertebral body marrow edema, vertebral body and disc enhancement, epidural or paraspinal inflammation/abscess, and canal compromise. Back pain and quality of life were evaluated using Visual Analog Scale (VAS) and the Oswestry Disability Index (ODI). Follow-up radiological studies were performed at 1, 6, 9 month intervals and then at yearly interval. Imaging characteristics seen at the follow up are graft uptake, consolidation of the disc space and fusion of the vertebrae. All patients included in the study underwent adequate drainage/debridement of the infected level followed by a stable pedicle screw fixation and interbody bone grafting harvested from the iliac crest or laminectomy bone. All the procedures were performed by the same surgical team in a single center. Intraoperative samples were sent for cultures, TB-pcr and Histopathological examination for confirmation of the diagnosis. A total of 21 patients with thoracic and lumbar spinal tuberculosis were studied meeting the inclusion criteria. All the patients were managed surgically. Infection was seen in thoracic level in 14 patients (66.6%) and lumbar level in 7 patients (33.3%) and highest in the T11 and T12 with 5 each, Figure 1 and Table 3. Among the patients, one (4.7%) patient was immunocompromised due to chronic liver disease secondary to alcohol abuse. One (4.7%) patient had been on prednisolone and etanercept for 8 years for Rheumatoid arthritis. One (3.1%) patient was on prednisolone for 10 year for Idiopathic Thrombocytopenic Purpura and splenectomised one month prior to surgery. Fever was present in 60% of the patients at presentation, whereas 11 patients (52.38%) presented with neurologic deficits. 8 patients with thoracic spondylodiscitis presented with upper motor neuron lesion and 3 of the lumbar spondylodiscitis patients presented with claudication and neurological deficits. Epidural abscess was seen in 13 patients in addition to bone and disc involvement, out of which 7 presented with neurological deficits. The mean Preop VAS score was 8.2. Leucocytosis was seen in about 13 patients (>10,000 cells/cu.mm). Mean Erythrocyte Sedimentation Rate (ESR) was 72.6 and C-Reactive Polypeptide (CRP) was 2.91, Table2. Organism was cultured in 10 patients, 7 patients TB-pcr was positive and remaining 4 patients’ Histopathological examination (HPE) was consistent with findings of tuberculosis which confirmed the diagnosis. Of the total 21 patients 14 of them were TB-pcr positive and the HPE was positive in 18 patients. All patients were given Antitubercular therapy using 4 drug regimen (Isoniazid, Pyrazinamide, Rifampicin and Ethambutol) for first 4 months and followed by 2 drug regimen (Isoniazid and Rifampicin) for 12 months. The mean number of operative vertebral levels was 4. The distribution of affected levels is shown in Figure 1. Mean duration of hospital stay was 20 days. All the patients were kept in hospital till suture removal, for a minimum period of 2 weeks; all the cases were informed to the RNTCP board. They were then discharged. 2 patients had delayed wound healing and 1 of them required debridement and secondary suturing for superficial infection. The culture pattern of the wound site did not show any organism. One patient developed cerebrovascular accident and she died 6 months postoperatively due to pneumonia and pulmonary complication. All patients were followed up for a minimum period of 12 months, one month after index surgery and 3 monthly intervals with clinical and radiological evaluation along with blood parameters for infection. All patients showed decrease in the ESR and CRP values on follow up. Out of the 11 (52.38%) patients presenting with neurological deficits 1 worsened and on follow up improved neurologically which was attributed to neuropraxia at the time of decompression in the index surgery. The back pain was reduced in 72% within 7 days, 92% within 1 month and 100% of the patients within 3 months of the index surgery. Radiological fusion was seen after 3 months in 60% of the patients, and after 6 months in 80% of the patients. After 10 months fusion was seen in 100% of the patients. The mean VAS improved from 8.2 (range: 6-9) preoperatively to 2.4 (range: 0-5). The mean preoperative ODI improved from 84% (range: 55 %-87%) to 36.8% (range: 16%-47%). No recurrence of infection was noted, apart from superficial skin infection which healed with debridement and regular dressings. Implant failure was not seen in any patient. Figure 3 and 4 depict one typical patient in our series. Tuberculosis remains the most common cause of death from infectious disease world-wide. According to the literature pott’s spine has been reported more frequently in older individuals [2,18,19]. Consistent with this, the mean age of the patients in our study was 52 years (range: 18 to 70). The main clinical presentation of the patient is lower back pain, which is present in 100% of our patients. Duration of symptoms and signs ranged from 2 to 12 months, which may reflect the under-diagnosis of this disease, where most of the patients were initially treated symptomatically with analgesics, as the clinical presentation is quite non-specific leading to delay in the diagnosis, at least at the first visit. Elevated ESR and CRP (inflammatory markers) were seen in 95.23% (20 patients) of our patients. In this study it was seen that elevated ESR had a strong association with Tuberculosis and who presented with epidural abscess, which is consistent with the literature. These inflammatory markers were also used for the post-surgical monitoring of the patients, where the ESR and CRP levels where decreased on follow up suggesting the subsidence of infection. Numerous underlying risk factors have been associated with the disease, such as diabetes mellitus, intravenous drug abuse, catheter-associated infections, surgical interventions, infective endocarditis, urinary tract infections, chronic alcoholism, and immunocompromised states, chronic kidney disease [21,22]. Our study shows a relationship of diabetes mellitus, steroids and HIV with the development of pott’s spine. Investigation of choice for radiological evaluation of patients is by MRI for detecting lesions of spinal tuberculosis, particularly at the initial stages, showing as bone marrow edema, and increased signal intensity of the intervertebral disc on T2 images, where the sensitivity reaches up to 95% . Using MRI studies we identified the anatomical levels of infection. Canal stenosis was observed in 13 patients, out of which 8 patients had epidural abscess, correlated with a high risk of neural involvement. Organism was grown in only 10 patients. 11 patients with no growth were diagnosed for spinal tuberculosis based on the TB-pcr and Histopathological examination which was consistent with diagnosis of spinal tuberculosis. In total TB-pcr was positive in 14 patients and HPE was consistent in 18 patients, showing higher sensitivity and specificity, in comparison. This is not consistent with the current literature which states that TB-pcr is most sensitive and specific among the three for the diagnosis of tuberculosis. It is generally accepted that all foreign materials may decrease the effectiveness of the antibiotics. They facilitate biofilm formation and bacterial adherence, a condition not readily recognizable for the immune system, and hampering the penetration of antibiotics . Oga et al. reported that M. tuberculosis has low adhesion capability and forms only a few microcolonies surrounded by a biofilm. And the use of titanium implants also prevents the biofilm formation, and decrease bacterial adherence. Surgeons usually do not prefer to debride and instrument in the single stage because residual bacilli might lead to persistence of infection. A single-stage procedure has several advantages such as avoidance of a second anaesthesia, shorter hospital stay, and lower complication rate and earlier mobilization. In the current study we have performed single stage posterior laminectomy and debridement of the infected segment, followed by posterior stabilization by pedicle screw-rod systems providing rigid segmental fixation along all the three columns of the spine along with bone grafting with titanium based implants which was used in all our patients. We saw no recurrence of infection after an average follow-up of 12 months. Implant failure was not seen in any patient. The fusion rate was 100% in our study. The findings of which were similar in other studies after single stage surgery, with fusion rate of 94% to 100% [12,23,24]. Reliable fusion promotes control of infection and early return to normal activities. Quality of life assessed with the VAS and ODI score showed statistically significant improvement. Tuberculosis should be considered as one of the causative agents in patients diagnosed with spondylodiscitis. Delay in surgical management of which has lead to development of unstable spine. Hence careful selection of patients with pott’s spine for surgical management is of outmost importance and no hesitation should be there in debridement and instrumentation. It was found to provide effective relief of symptoms and better quality of life with early mobilisation. 1. Bipul Borthakur, Sourav Patowary. Spinal Stabilization for early mobilization in Pott’s spine. Br J Med Health Res. 2016;3(12).1. Bipul Borthakur, Sourav Patowary. Spinal Stabilization for early mobilization in Pott’s spine. Br J Med Health Res. 2016;3(12).2. Liang Zhang, Wei-Hua Cai, Bo Huang, et al. Single-stage posterior debridement and single-level instrumented fusion for spontaneous infectious spondylodiscitis of the lumbar spine. Acta Orthop. Belg 2011:77, 816-822.3. Jacob A. Miller, Rebecca L. Achey, Adeeb Derakhshan, et al. Neurologic Complications, Reoperation, and Clinical Outcomes After Surgery for Vertebral Osteomyelitis. Spine Journal 2016:41:4, 197–204.4. Eftichia Kapsalaki, Nikolaos Gatselis, Aggelos Stefos, et al. Spontaneous spondylodiscitis: presentation, risk factors, diagnosis, management, and outcomes. International Journal of Infectious Diseases 2009:13, 564-569.5. Leopold Arko, Eric Quach, Vincent Nguyen, et al. Medical and surgical management of spinal epidural abscess: a systematic review. Neurosurg Focus 2014:37:2, E4.6. Ahmed S. Mohamed, Jung Yoo, Robert Hart, et al. Posterior fixation without debridement for vertebral body osteomyelitis and discitis, Neurosurg Focus 2014:37:2, E6.7. Friedman JA, Maher CO, Quast LM, et al. Spontaneous disc space infections in adults. Surg Neurol 2002 ;57 : 81-86.8. Kapsalaki E, Gatselis N, Stefos A et al. Spontaneous spondylodiscitis : presentation, risk factors, diagnosis, management, and outcome. Int J Infect Dis 2009 ;13 : 564-569.9. Karadimas EJ, Bunger C, Lindblad BE et al. Spondylodiscitis. A retrospective study of 163 patients. Acta Orthop 2008 ;79 : 650-659.10. Hadjipavlou AG, Mader JT, Necessary JT, et al. Hematogenous pyogenic spinal infections and their surgical management. Spine 2000 ;25 : 1668-1679.11. Honan M, White GW, Eisenberg GM. Spontaneous infectious discitis in adults. AmJ Med 1996 ;100 : 85-89.12. Gonzalvo A, Abdulla I, Riazi A, De La Harpe D. Single-level/single-stage debridement and posterior instrumented fusion in the treatment of spontaneous pyogenic osteomyelitis/discitis : long-term functional outcome and health-related quality of life. J Spinal Disord Tech 2011;24 : 110-115.13. V. Makeshkumar, Radha Madhavan & Sujatha Narayanan. Polymerase chain reaction targeting insertion sequence for the diagnosis of extrapulmonary tuberculosis. Indian J Med Res 139, January 2014, pp 161-166. 14. Akiyama T, Chikuda H, Yasunaga H, et al. Incidence and risk factors for mortality of vertebral osteomyelitis: a retrospective analysis using the Japanese diagnosis procedure combination database. BMJ open 2013;3:e002412;1-6.15. Oga M, Arizono T, Takasita M, Sugioka Y. Evaluation of the risk of instrumentation as a foreign body in spinal tuberculosis. Clinical and biologic study. Spine 1993; 18:1890-4.16. Krogsgaard MR, Wagn P, Bengtsson J. Epidemiology of acute vertebral osteomyelitis in Denmark: 137 cases in Denmark 1978–1982, compared to cases reported to the National Patient Register 1991-1993. Acta Orthop Scand 1998;69: 513-7.17. Ozalay M, Sahin O, Derincek A et al. Non-tuberculous thoracic and lumbar spondylodiscitis : single-stage anterior debridement and reconstruction, combined with posterior instrumentation and grafting. Acta Orthop Belg 2010 ; 76 : 100-106.18. Martinez Hernandez PL, Amer Lopez M, Zamora Vargas F et al. [Spontaneous Infectious Spondylodiscitis in an internal medicine department : epidemiological and clinical study in 41 cases.] (in Spanish). Rev Clin Esp 2008 ; 208 : 347-352.19. Hutchinson C, Hanger C, Wilkinson T, Sainsbury R, Pithie A. Spontaneous spinal infections in older people. Intern Med J 2009 ; 39 : 845-848.20. Ledermann HP, Schweitzer ME, Morrison WB, et al. MR imaging findings in spinal infections: rules or myths? Radiology. 2003 Aug;228(2):506-14. Epub 2003 Jun 11.21. Hopkinson, N., Stevenson, J., and Benjamin, S. A case ascertainment study of septic discitis: clinical, microbiological and radiological features. QJM. 2001; 94: 465–470.22. Forestier, E., Sordet, C., Cohen-Solal, J., Remy, V., Javier, R.M., Kuntz, J.L. et al. Bone and joint infection due to Streptococcus pneumoniae in two immunocompetent adults. Joint Bone Spine. 2006;73: 325–328.23. Kuklo TR, Potter BK, Bell RS, Moquin RR, Rosner MK. Single-stage treatment of pyogenic spinal infection with titanium mesh cages. J Spinal Disord Tech 2006 ; 19 : 376-382.24. Przybylski GJ, Sharan AD. Single-stage autogenous bone grafting and internal fixation in the surgical management of pyogenic discitis and vertebral osteomyelitis. J Neurosurg 2001 ; 94 : (1 suppl) 1-7.25. Mohammad R. Rasouli, Maryam Mirkoohi, Alexander R. Vaccaro. Spinal Tuberculosis: Diagnosis and Management. Asian Spine Journal Vol. 6, No. 4, pp 294-308, 2012.26. Vijaya Prasad Balda, Kadali Satyavaraprasad. Surgical management of tuberculosis of dorsal spine and dorsolumbar spine: Anterior versus posterior approach. Journal of Dr. NTR University of Health Sciences 2016;5(2).27. World Health Organization. Stop TB annual report 2001. Geneva: WHO, 2002. How to Cite this article: Mahesh M, Jain VK, Ravikumar T V. Outcome of Instrumentation in Spinal Tuberculosis. Journal of Trauma and Orthopaedic Surgery. April – June 2017;12(2):8-12.